I was recently interviewed by Jennifer of 6ftMama for her podcast. Listen to the full show below & check out her website & Facebook group! It has been a BUSY week since The Foodscape Revolution hit the shelves at books stores across the US and Canada! Thank you everyone for your generous support, encouragement and interest in learning to make the most of the landscape you already cultivate! The official book debut was held at the Philadelphia Flower Show on Thursday 16 March. The reviews are starting to pour in and I am so grateful for gardening experts to share their opinions. 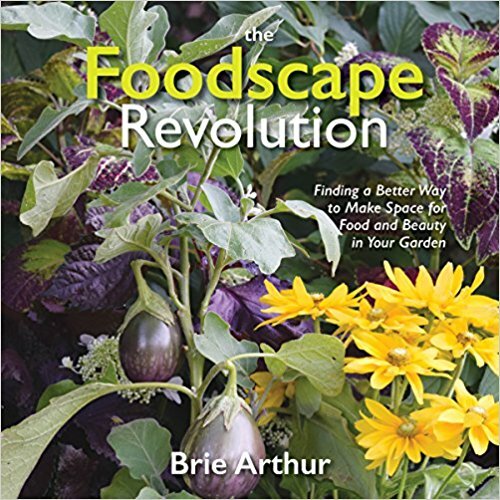 Thank you All the Dirt on Gardening for taking the time to read The Foodscape Revolution and share your thoughts! “Garden to Table” is the best way to describe my passion for adding purpose to landscapes in suburban neighborhoods, office parks, school campuses and retirement communities. With an education in design, an enthusiasm for ornamental horticulture, and a hunger for local, organically raised produce I see that there is the potential to grow food in cultivated spaces. In fact, according to extension service data, there’s about 190 million acres that could be utilized to enhance food production in the US. Cultivating food is more than a trend; it’s a tremendous opportunity for the greenhouse and landscape industry to meet a consumer desire that will not be going out of style. Edibles enhance landscapes by providing a unique seasonal component with a multitude of health and economic benefits. Consumer interest in growing food is a unique opportunity for the green industry to lead the way through education, production of plant material, design, installation and maintenance services. Foodscaping is simply the integration of edibles in a traditional ornamental landscape. This design strategy is meant to empower the green industry for generations to come. By connecting the expertise of growers and landscape professionals to the local, sustainable food movement, horticulture professionals are poised to play a critical part in the literal food chain. Landscapes that present nutritional, ecological and aesthetic value meet the needs of the evolving market. I am not only referring to the sometimes sluggish “millennial age consumer.” Many baby boomers, like my parents, are retiring and downsizing. They are approaching landscape services with a different sensibility and have a desire to make the most of less square footage. They are steering away from large lawns, high maintenance hedges and spray regiments. What they are looking for now is “garden-landscape fusion” with fresh tomatoes alongside the boxwood hedge with and a ground cover of fresh salad greens adjacent to the knock-out rose. It’s important that as we nurture this emerging market we recognize that there are misconceptions revolving around how to grow food in modern landscapes. Many homeowners believe property values will go down with a rogue farmer on the cul de sac, hence the many restrictive HOA covenants. It is important to communicate and recognize that landscapes are not meant to be farms. Rather, the goal of a foodscape is to cultivate supplemental amounts of produce while meeting the aesthetic standards of the surrounding community. Education will lead to opportunity and there are many perennial edibles that can be included in thelandscape. Fruit and nut trees offer long term harvests while herbaceous perennials such as asparagus and strawberries provide seasonal bounty and textural contrast. Herbs like oregano, rosemary and thyme are low maintenance plants that add high culinary impact. The inclusion of flashy annual crops like tomatoes, peppers, kale and chard will add brilliant colors that blend beauty and abundant harvest. Growers and retailers can shape the Foodscaping movement by offering interesting edibles including heirloom varieties and AAS award winning selections. Choose plants that thrive in your region and promote the unique qualities that make your area the perfect climate for a specific collection of edibles and ornamentals. This will result in increased consumer confidence and success. With thousands of edibles to choose from growers have the ability to promote a diverse collection of annuals, perennials, trees and shrubs, making every landscape a profitable opportunity. Traditional field crops may be the ultimate gateway for the foodscape revolution. Seldom addressed in the local food movement, ancient grains are making waves, recently named “the next culinary obsession” according to the New York Times. From edible meadows to sophisticated spaces using clumps of oats, quinoa, rice, sorghum and wheat grains offer low maintenance requirements with a big design impact. They are essentially an ornamental grass with a nutritional benefit. Grains provide seasonal interest and actively engage people who have likely never seen a wheat or rice plant growing. Engagement is a powerful component for successful design. Sustainable management is the most critical component for a thriving foodscape. Consumers have created the value of organic produce and the demand for a “greener” approach to landscape maintenance is particularly strong with edibles. Successful plantings always start with healthy, living soil. Transitioning from hard chemistries and salt based fertilizers in the landscape can seem overwhelming, but there are effective organic products and bio-control programs that can easily be applied to every landscape ensuring a safer world courtesy of the green industry services. Foodscaping offers a solution to the food miles crisis while helping eliminate food deserts in communities that need it most. A newly emerging market revolves around the harvesting, processing and distribution of the crops grown in professionally managed foodscapes. Commonly designed like a CSA, produce can be handled in a number of ways including weekly crop shares distributed to paying members. Another effective approach is partnering with local restaurants. Programs such as Ample Harvest can be utilized to donate produce directly to food banks serving the community. As professional horticulturist I strive to meet the needs of a growing population and focus on ways to extend horticultural relevance in the American society. I am proud to see plants being recognized for all of the attributes they represent: beauty, ecology, health, wellness, nutrition and lifestyle. Foodscaping is a design technique that embraces the heritage of home gardening while developing a new level of sophistication for modern day living. Green industry professionals are poised to become more essential than ever by designing, installing and maintaining foodscapes that will feed our communities in a sustainable way. Join the Foodscape Revolution and harness the sun, soil and irrigation systems of the everyday landscape and start using your skills to nourish community while setting a high standard for beauty and ethical land care. Consumer interest is there, let’s lead the way! Foodscaping is all about making the most of the landscape you have. Take advantage of the open mulch space between ornamental plants and use the bed edge to grow and harvest crops such as garlic, onions, lettuce, peppers and peanuts. Tune in and learn about how to manage your home foodscape organically! Today is an exciting day… my book cover has been revealed. Between professional travel, speaking and consulting I am writing a book about my passion for making the everyday landscape RELEVANT. I promise, this is not “another vegetable gardening book”. This book encourages everyone to “think outside of the box,” and to learn how pairing edibles in a traditional ornamental landscape can be beautiful and HOA approved. Focusing on simple ways to enhance existing landscapes, I discuss how to use open mulch space and bed edges to grow meaningful amounts of produce to help reduce the food miles crisis, ensuring that quality produce is available in every home and community. The book discusses how foodscape design increases bio-diversity and encourages sustainable land management practices that are affordable and time-efficient for homeowners and renters. The best edible and ornamental pairings are featured to inspire readers to create purposeful landscapes that engage people of all ages. Several projects, from simple to complex, are outlined in the book so that readers can get started foodscaping right away. The Foodscape Revolution features fun and easy solutions to growing food and community. The ‘Yard to Table’ recipes are delicious and are sure to resonate with readers who have an appetite for growing and eating organic, local food. Every landscape offer an opportunity to grow wonder, ecology and nutrition. Join the revolution and turn your ordinary yard into a Foodscape!